Sarah is an illustrator. 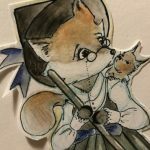 She creates watercolour and ink paintings. To commemorate Rosa Parks and her stand against discrimination and segregation, artist Sarah Chippefield offers a cartoon on her legacy. To celebrate World Space Week, artist Sarah Chippefield offers a cartoon on the sometimes short-sighted attitude of humanity. On the 99th anniversary of the death of Andrew Carnegie, artist Sarah Chippefield offers a cartoon on the man who built Ramsgate Library.